About twenty years ago, in the early 1990s, while in southern Florida to give a presentation, I came across an ad in the local newspaper about a clinic in Ft. Myers, FL that was using a laser to treat floaters. I called the doctor, Scott Geller, MD, and asked him about this interesting use of lasers. I never did anything with my notes of that conversation, but the thought of writing about it stuck in my head. Several days ago, I came across a blog (Healthy Times), that contained an article titled: “Do I Have to Live with Those Floaters?” It was written by Dr. James H. Johnson of Irvine, CA. I thought it was an excellent introduction to the potential treatment of bothersome floaters, using the YAG laser. The writeup reminded me of my long ago conversation with Scott Geller and, with my natural curiosity about all things laser, I decided to look into this use of lasers in more detail. I quickly learned two things: the use of lasers to treat floaters is quite controversial, and secondly, only three doctors in the U.S. specialize in this procedure – Drs. Geller and Johnson, and Dr. John Karickhoff, in Falls Church, VA. So I thought I would try and find out why. I have contacted each of the three doctors and asked them for some background information. I will use that information to tell the “story behind the story” of why YAG lasers can and are being used to treat troublesome floaters. Do I Have to Live with These Floaters? As the eye ages, the normally clear vitreous gel in the back of the eye can degenerate, dehydrate and clump up. This degenerating vitreous gel can cast shadows on the sensory retina of the eye. These moving shadows are commonly referred to as "eye floaters." There is an infinite variety as to the severity and configuration of these vitreous clouds, strands, fog banks and other shadowy shapes. The hallmark characteristic, though, is movement of shadows and this movement cannot be duplicated by any other pathology in the visual system. There are serious, although rarer, conditions that can also cause floaters, such as retinal tears or hemorrhages, inflammatory conditions, diabetes, autoimmune disorders and infections. New onset floaters should be evaluated by an eye care professional to rule out these important conditions. Fortunately, most eye floaters are benign in the sense that they are not a threat to the overall health of the eye. Many who suffer these eye floaters will argue that they are not benign if you consider how they can significantly affect the quality of vision as well as the quality of life. Eye care professionals have done a poor job addressing the concerns of people suffering from floaters. Patients are commonly told that their brain will adjust, or that floaters will go away on their own, or simply to just "learn to live with them." 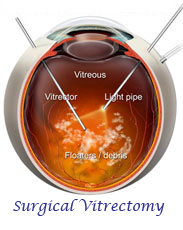 At the other end of the treatment spectrum is the surgical vitrectomy. The vitrectomy requires inserting three probes into the eye and removing all of the vitreous gel and replacing it with a saline solution. Because of the known and potentially serious risks, this option is rarely offered or even mentioned. A non-invasive, painless and less risky alternative is the use of an FDA-approved eye laser to systematically ablate and vaporize the vitreous densities. This procedure has a two-decade history, yet it is not taught in any conference or medical education program. There are only three doctors in the U.S. with any significant experience and only a few more worldwide who even offer the procedure. Dr. James H. Johnson is a Diplomate of the American Board of Ophthalmology and is founder and medical director of Vitreous Floater Solutions in Irvine, Calif. He has dedicated his career to the treatment of bothersome and annoying vitreous eye floaters. Dr. Johnson has the only medical practice in the world exclusively offering the YAG laser photodisruptive ablation procedure. Not all eye floaters can be treated, but it may be worth your time to find out. What are Floaters, What Causes Them, and How are They Treated? Eye floaters are those tiny spots, specks, flecks and "cobwebs" that drift aimlessly around in your field of vision. While annoying, ordinary eye floaters and spots are very common and usually aren't cause for alarm. Floaters and spots typically appear when tiny pieces of the eye's gel-like vitreous break loose within the anterior portion of the eye. 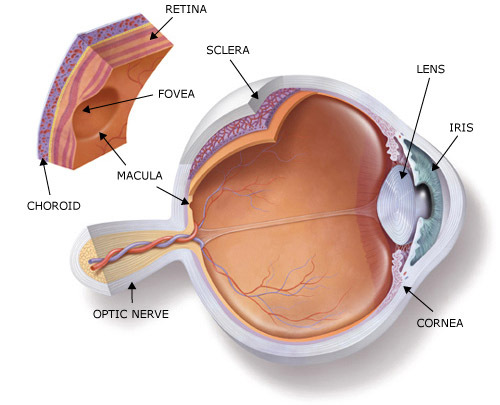 See Figure 1, the structure of the eye and Figure 2, that shows the position of floaters in the vitreous in a typical situation. When we are born and throughout our youth, the vitreous has a gel-like consistency. But as we age, the vitreous begins to dissolve and liquefy to create a watery center. Some undissolved gel particles occasionally will float around in the more liquid center of the vitreous. These particles can take on many shapes and sizes to become what we refer to as "floaters." A "Vitreous Floater" is described as a moving visual shadows of various shapes and densities. The floaters that can be treated with a laser are due to benign condensations of the normally clear vitreous humour, the gel that occupies the back part of the eye, and those caused by a posterior vitreous detachment. Floaters are common, and can range from "none" or "barely perceptible" to “moderate”, causing some visual discomfort, or “severe” which might be functionally debilitating. Moderate or severe floaters can significantly affect the quality of vision and the quality of life for those suffering them. Vitreous floaters are defined as any change to the normally optically transparent vitreous body that are significant enough to cast a shadow onto the sensory retina and be noticed by the sufferer at least some of the time. 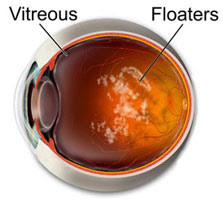 There are two types of vitreous floaters – benign and pathological. Benign floaters are those not related to or caused by ocular or systemic disease or abnormal pathological events such as hemorrhage or foreign material. Benign floaters are never a threat to the health of the eye no matter how dense and bothersome they may be. Pathological floaters are associated with abnormalities and disease of the eye or body. They may be reactive, autoimmune, hemorrhagic, metabolic, genetic, parasitic or foreign material in origin. Of these, reactive inflammation and hemorrhage are the more common. Doctors will not treat these with a laser, but look to the underlying cause and treat that. The most common causes or associations with the onset of vitreous floaters are age, myopia (near-sightedness), trauma, and unknown. There may be molecular changes that occur which begin the process, especially with ageing. The vitreous gel is 99% water and 1% solid elements. The solid portion is composed of collagen filaments coated with hyaluronic acid molecules. The ability of hyaluronic acid molecules to retain water molecules is an important factor in maintaining the gel consistency of vitreous. Bare collagen tends to be sticky. If the hyaluronic acid (HA) molecules are no longer attached or associated with the collagen, it will clump, and stick to itself squeezing water molecules out. With age, there is a depolymerisation of hyaluronic acid, causing these molecules to release their water and form lacunae i.e., pockets of liquefied vitreous. The collagen 'filaments' aggregate to form larger 'fibrils', causing further collapse of the vitreous gel structure. This process is known as vitreous degeneration and 'syneresis'. The collagen fibrils may 'float' within the liquid vitreous pockets, giving the patient a sensation of floaters. 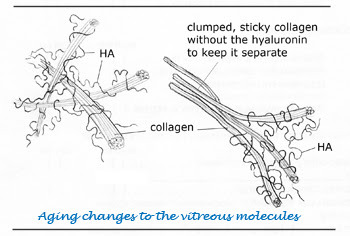 The drawing below (Figure 3) is a visualization of the even distribution of collagen under normal circumstances, as well as the proposed mechanism that occurs when hyaluronic acid (or hyaluronin) molecules disassociate themselves from the collagen, causing the collagen to clump. When patients present to most eye doctors with floaters, the common theme is to tell them that they shouldn’t worry about the floaters (unless they are being caused by some underlying retinal problem and that problem needs to be treated) – that they will “go away” or you will “get used to them” as your brain adapts and they will “disappear” from interfering with your vision. The use of the YAG laser to treat bothersome floaters has not been widely accepted by the ophthalmic profession and remains an “off-label” indication using an FDA-approved ophthalmic lasers for select cases. But, as will be described below, the three ophthalmologists featured in this article have been and are currently, treating thousands of patients with troublesome floaters and ridding them of this problem using laser vitreolysis. Of course, a full vitrectomy – the removal of the vitreous fluid, replaced with a balanced electrolyte solution, is a “cure” of last resort. Also, a new surgical technique of microincision vitrectomy might offer a less intrusive surgical intervention. However, because no sutures are used to close the incision, there could be more of a risk of infection. Of course, there are potential risks with any vitrectomy surgery, such as endophthalmitis, retinal tears, bleeds or detachments. Laser vitreolysis is the use of the ophthalmic YAG laser to dissipate floaters. To understand how this is done, you have to understand a little about the ophthalmic YAG laser. The ophthalmic YAG laser was first used to photodisrupt opacities in the lens capsule following cataract surgery. When an intraocular lens is inserted into the lens capsule, following removal of the cataractous lens, in many cases foreign materials remaining in the capsular bag can migrate to the posterior capsule and form opacities, decreasing good vision. The ophthalmic YAG laser is capable of being focused to a very small spot and is used to photodisrupt (destroy) those opacities. This same property, of photodisruption, can and is used to “vaporize” vitreous floaters. The major problem is obtaining a laser that can be focused in the vitreous to be used to photodisrupt the floaters within the vitreous in the posterior chamber. The three ophthalmologists now practicing laser vitreolysis have obtained ophthalmic YAG lasers, and the appropriate delivery systems, capable of operating within the vitreous and thus capable of breaking up floaters. What kinds of floaters can be treated with the laser? 2) If there are numerous clumps, or the clumps are very large and free floating in the vitreous, they can be more difficult to treat with the laser, but usually can be treated. 3) If a large degenerative cloud is suspended in the line of sight with one or two thin strands, the doctor can frequently cut the strands which relocates the floater clump to another part of the vitreous out of the line of sight. This improvement is frequently dramatic. Success with this type of floater is 90 percent or higher. Laser disruption is accomplished as follows. After dilating the pupil, a numbing eye drop is given and a special contact lens for treating eye floaters is placed on the eye. Then the laser, which is focused to a 6 micron spot, is carefully aimed, and the floater or floaters are either vaporized with the laser, or the floater's attachments are vaporized so that the floater is repositioned to a different part of the eye. This disruption also helps the eye to absorb any remaining particles. After vaporizing the big floater or floaters, the doctor may have to leave tiny particles that are just too small to aim on. The disruption is done with a beam of invisible light through the pupil. There is no incision or discomfort. Depending on the type and amount of the floater, the procedure may take as little as 5 minutes or up to half an hour. Post-operatively there are no restrictions on activities. The patient is seen the next day. Occasionally it is not possible to disrupt the floaters in one sitting. In that case an additional sitting may be required. Rarely are the floaters not disrupted. This laser procedure actually gets rid of floaters, not just breaking them into smaller pieces. The laser process used is called “optical breakdown”. This same process is used by all cataract surgeons, as noted above, to make a clear hole with a YAG laser in postoperative cataract membranes. 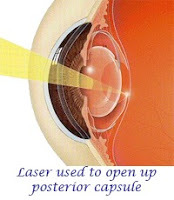 The laser procedure has major advantages over the vitrectomy procedure. The laser procedure breaks up the floaters without changing the rest of the vitreous or other eye structures. The other main advantage over vitrectomy is that the laser procedure does not open the eye. When the eye is opened in vitrectomy, there is some risk of infection, wound leaks, retinal detachment, and cataract formation. The first laser was developed in 1960, a ruby laser designed and built by Ted Maiman. The first YAG laser was built in 1964, and was a continuous wave (CW) laser. CW YAG lasers are still used in surgery for cutting and coagulation of tissue. The first pulsed lasers for ophthalmology (Q-switched and mode-locked) were independently developed by Danielle Aron-Rosa in France (mode-locked) and Franz Fankhauser in Switzerland (Q-switched) in the mid-1970s and commercialized several years later by several companies. Mode-locked lasers were difficult to maintain and eventually were entirely replaced by Q-switched devices, which were smaller and easily maintained. In 1983, the first ophthalmic YAG lasers won FDA marketing approval in the U.S. and by 1984 or 1985, there were at least thirty different companies marketing Q-switched YAG lasers to the ophthalmic community. Today, there are probably six or eight major suppliers of ophthalmic YAGs, and these lasers are found in just about every general or refractive ophthalmologist’s office, primarily for performing posterior capsulotomies. It was probably Fankhauser, using his Lasag Q-switched laser in the late 1970s or early 1980s that first performed work in the vitreous to cut vitreous strands, using special optics that he designed. According to Dr. Scott Geller, he heard about the work that Franhauser was doing and visited him in Switzerland in the early 1980s. He was impressed with what he saw and decided to begin using his ophthalmic YAG laser in the vitreous upon his return to the United States. Dr. Geller probably performed his first laser vitreolysis in 1985 or 1986 and began to specialize in treating floaters by about 1989. Dr. Karickhoff believes he did his first floater, an opacified string stretched across the visual axis in early 1990, with no knowledge that the procedure had been done elsewhere. Thinking that the procedure was only suitable for strands he did not do it again until 1999. He himself had developed a bothersome floater, learned about Dr. Geller and had Dr. Geller treat his floater. He then observed Dr. Geller perform the procedure on isolated floaters, learned about the technique used and brought this technique back into his office and began performing the procedure in earnest at that time. Dr. Johnson had opened a LASIK practice in 2007. He had seen Dr. Karickhoff’s web site and bought his book Laser Treatment of Floaters. He found the technique intriguing, enjoyed some early success in treating floaters and within a year, he closed his LASIK practice and began specializing in performing laser virtreolysis. Why Aren’t Other Ophthalmologists Using Lasers to Treat Floaters? So this begs the question, why aren’t other ophthalmologists using their YAG lasers to treat floaters? “We can't answer for others, but we know that there seems to be little interest in this "benign", non-pathological condition. No pharmaceutical companies can benefit, and the manufacturers already have their lasers FDA approved. We think that in general eye doctors have not really been listening to their patients when they have visually-significant or dense floaters. In general, once your eye doctor has determined the absence of retinal detachment or other serious pathology, they try to reassure you or minimize the concern and then move on to their next challenge. “How is it possible that all eye doctors know of the vitrectomy operation for floaters which carries significant risk, but almost no eye doctor in the country has done the laser operation, seen the laser operation, received any training in it, or is familiar with it? The first part of the answer is that the procedure came entirely from European research. The research was done by Franz Fankhauser, M.D. and Daniele Aron-Rosa, M.D., still the most respected laser researchers in the world. Unfortunately, their reports were buried in the European literature except for only one United States paper in 1985 (see World Literature page on my web site). So doctors here had almost no opportunity to read about the procedure. Secondly, a proper laser for the procedure was not readily available. 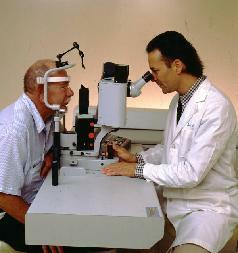 In 1978 Doctor Fankhauser developed a laser specifically for working in the vitreous and published the technique for laser disruption of eye floaters. But his Swiss made laser was very large, and never became well known in the United States. So its production stopped in 1993. By then the market was dominated by smaller lasers. These are the lasers now owned by doctors and hospitals throughout the world. Unfortunately, they were designed for disrupting cataract membranes and most of them can not disrupt floaters in the mid or deep vitreous. A final reason that many doctors have taken no interest in obliteration of floaters is because they are not aware of how helpful it can be to some patients. Certainly some patients can forget about their floaters, but if they are large and near the retina, this is not possible. Why do some eye doctors, although not familiar with the laser procedure, feel a sincere ethical and moral obligation to warn their patients against the procedure? The first reason probably is that from the doctor's studies of eye anatomy, it would seem that this treatment might cause retinal detachment. But actually, the entire world literature does not report any retinal detachments. I am familiar with an additional 1,600 cases of laser treatment of eye floaters that are not in the literature, and there were no retinal detachments in those cases either. It is true that a laser working in the vitreous can cause complications, but this almost always comes when cutting membranes or clearing hemorrhage, not from treating floaters. The second reason is that until fairly recently it was firmly believed by most eye surgeons that any manipulation of the vitreous was harmful. But in the 1970's it was learned that vitreous manipulation and even its complete removal from the eye under controlled conditions can be helpful in many cases. Much of this work and the instrumentation was developed at the Duke Eye Center where I trained and remain on its Advisory Board. In spite of this new knowledge, any operation on the vitreous, even with a laser where there is no incision and no removal of vitreous, is still met with some caution. (A PERSONAL NOTE): I completely understand and sympathize with the feelings of eye doctors when they first learn of this procedure. When I first heard of the procedure, I said: "I do not think there is any such procedure, but if there is, it is dangerous, and I would never trust an eye doctor who does it." But I had a strong reason to be very curious. In college I had a serious internal eye infection from toxoplasmosis that sparked my interest in ophthalmology. Ten years later I had a recurrence of that infection that left me with a large floater in my right eye that affected driving slightly, was very annoying when reading, and I always saw it when using the direct ophthalmolscope with my right eye. Any time I saw a floater, I had to shift my eye to learn if I was seeing the patient's floater or my floater. So, I called the doctor's office (Dr. Geller) who does the laser procedure for floaters, believing that he was doing an illegitimate procedure, and that he would never let an unknown ophthalmologist, like me, observe it. To my shock he said: "Certainly you can watch a procedure. I would love to meet you because I use the surgical contact lens you designed to examine every floater patient!" So, 24 hours after hearing of the procedure I was in the doctor's office and watched him through an observer's scope attached to his laser completely remove the floaters from the deep vitreous of two patients. One year later, after studying the literature, I had him operate on my floater. The next morning I saw 20/10 with my right eye and since then have had no trouble driving, reading, and do not see the floater when using the ophthalmoscope. Who, why, what lasers do they use, when did they start, how many patients have they treated, what is their success rate, etc. 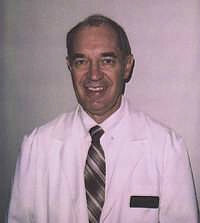 Scott Geller M.D. performs a wide range of ophthalmic surgical procedures for conditions such as cataract, glaucoma, corneal disease, and refractive errors. His special interest in vitreous floaters has helped thousands of patients from around the world who have sought his help. 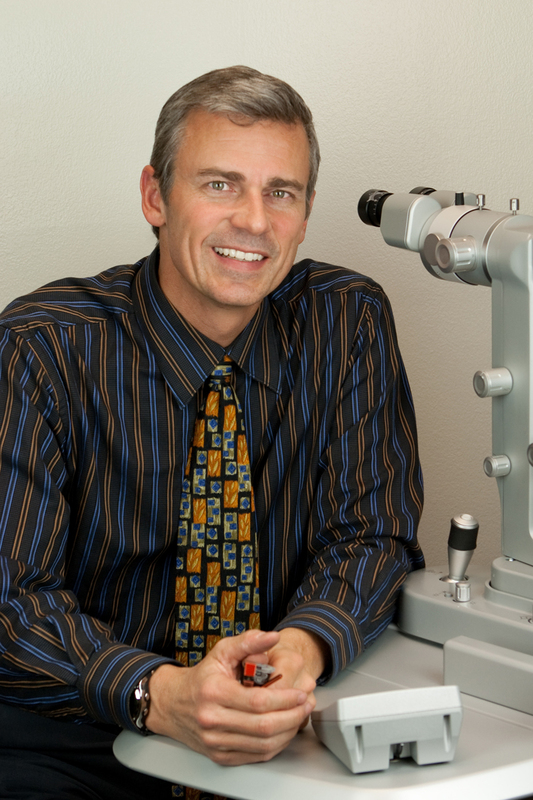 Dr. Geller is usually available to speak with potential patients, or their ophthalmologists. Call us during normal hours (eastern US time) at 239-275-8222 or 877-371-3937 (free call in the US). Web video conference is available throught iChat/AOL or YahooIM. Call us for details. Doctor Karickhoff received his M.D. degree and his ophthalmology training from Duke University. After serving in the U.S. Army Medical Corps for two years (Bronze Star in Vietnam), he began private practice in Falls Church. Since 1970 he has also taught at Georgetown University where he is Clinical Associate Professor of Ophthalmology and received their Vicennial Teaching Award. He is Board Certified by the American Board of Ophthalmology and serves on the Advisory Board of the Duke University Eye Center. Doctor Karickhoff is recognized locally and nationally as a surgical innovator. He has introduced many surgical techniques to the Washington area such as no-stitch cataract surgery and laser disruption of vitreous floaters (first case in February 1990). 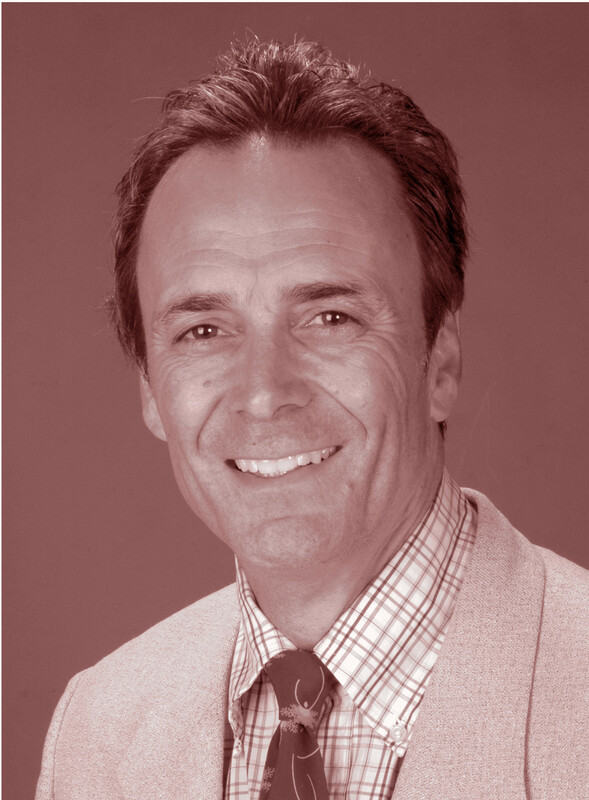 His unique career includes surgery, teaching, research, inventions, patents, instrument and device designs, originating surgical techniques, and 39 internationally published papers. Doctor Karickhoff has written the world's only book on laser treatment of eye floaters and has performed the procedure over 2,500 times. He can be reached at his Falls Church, VA office by calling (703) 536-2400. Dr. James H. Johnson is a Diplomate of the American Board of Ophthalmology and is founder and medical director of Vitreous Floater Solutions in Irvine, Calif. He has dedicated his career to the treatment of bothersome and annoying vitreous eye floaters. Call 949-253-5770 to make an appointment. 4. Intraocular Photodisruption With Picosecond and Nanosecond Laser Pulses: Tissue Effects in Cornea, Lens, and Retina, Alfred Vogel, Malcolm R. C. Capon, Mary N. Asiyo-Vogel, and Reginald Birngruber, Tissue Effects of Picosecond and Nanosecond Photodisruption, Invest Ophthalmol. Vis. Sci. 1994;35:3032-3044. 5. Neodymium: Yttrium-Aluminum-Garnet Laser, Franz Fankhauser & Sylvia Kwasniewska, Ophthalmic Lasers, Vol. III, Francis L’Esperance, CV Mosby, 1989, pgs 781-886. 6. The Outlook for Medical Laser Systems: The Surgical Revolution, Irving J. Arons, Arthur D. Little Decision Resources, December 1986. Interesting compilation, Irv, thanks for putting this together and sharing. Interestingly, possibly the best lasers for this application were made back in the late '80's, and have long been obsoleted. Lasag did make a Picoruptor for a few years, and as the name implies, had a pulse width measured in picoseconds. I believe it was mode locked. All of us working in the field at the time were looking for ways to reduce the energy per pulse in these lasers, and still keep it stable, from pulse to pulse. The CooperVision/Alcon YAG 2500, which I was in charge of, was no exception. We were able to get reliable pulse energies down to 250 microjoules, with pulse resolution in the 100 ujoule realm. It also came equipped with a micromanipulator, a feature rarely found on today's YAG lasers. I believe some of the technical challenges here are, besides visualization for the clinician, are the longer working distances, which will imply a larger spotsize, and thus higher cutting energies. Of course, all of this occurring closer to the retina. Of course, you were not really able to answer the question, "What Causes Floaters". I'm glad you acknowledged the cause is "unknown". A description of the process known as vitreous degeneration and 'syneresis' begs the question - why does this process start in some individuals at a very young age? I started experiencing very bad vitreous floaters at age ten. (I'm 54 years old now, and they are still with me.) Other people with floaters have told me they started to notice their floaters at around the same age. Common? Not when they are really, really bad! Where are the epidemiologists? The molecular biologists? The geneticists? Part of the problem is the ophthalmic research community has failed to consider idiopathic vitreous floaters as a diagnostic entity worthy of study. THANK GOODNESS FOR THIS ARTICLE. BEFORE READING THIS, I HAD DISCOVERED DR. GELLER ONLINE. JUST HAPPENED TO ME A FEW DAYS AGO. AS THIS IS NOT SUCH A TERRIBLE THING IN THE REALM OF WHAT COULD BE. Thanks Irv..thats a commendable work. We floater sufferers are obliged with that information. Thanks so much for this post. I'm seeing a retinal specialist today for a sudden large floater that developed in an eye that already has a cataract. I'm 60 so it isn't unexpected, but still scary. I wonder why there hasn't been research on drugs to counteract floaters, it seems reasonable to presume that something might work to break them up. Wonderful weblog! I genuinely enjoy how it's uncomplicated on my eyes as well as the info are well written. I'm questioning how I could be notified whenever a new post has been made. I have subscribed to your rss feed which must do the trick! Have a nice day! You've found the way to get any new postings I make on my online Journal. By subscribing to the RSS feed (found on the right-hand side of the home page), you will be notified each time I add a new post. Greetings folks, I was wondering if anybody has ever taken pictures of floater cells enlarged hundreds of times or even make that thousands of times than what I seem to be able to find. I am an artist, painter and apprentice to the S.H.Rogoff who discovered the double or reverse after image at yale in 1952. Hal's double or reverse pic "Yellow Diamonds" can be seen commonly in psych 101 textbooks. But back to my question. Back in 60's I used the floater cell to determine when particular visual activities could be engaged. By blowing up the size of the single cell one would notice triangular shapes on the outside of the cell wall that seemingly passed over vacant section of the cell wall in a spiral fashion emereging again on the other side. The cell also had remnants of the square scetion that encased the single cell before it fell apart and what was left was four barbs that themselves had chain saw tooth like structures that appeared to move along them. So I was wondering if anybody ever discected and drew the images or captured them in a camera at intense magnification? Thanks for this extensive, well written, and very informative article. I myself had a large swath of floaters in my left eye appear last summer. Iv'e always had floaters as far back as I can remember. But this one is quite different as it essentially hangs in there like a cloud. My ophthalmologist told me to hope for the best as there is no known treatment. Last week a rather large floater appeared and it's like a blackbird constantly flying in front of me. To say the least I was devastated. I started reading blogs by sharpshooters out West with the same condition and several brought up both types of procedures. Thanks Irv for putting this out there. I have a deeper understanding the preferred laser procedure and know my choices. It would appear from my having having done research on the YAG procedure and the qualifications of these three physicians, that the chances of greatly improving and/or eliminating bothersome floaters is upwards of 95% with a barely perceptible risk factor. Sounds like good odds if you can afford the out of pocket or your insurance covers the cost. Not much more expensive than Lasik Treatments for nearsightedness. I have had the best luck observing a floater in good light against the sky. The large one I have now I can't get a focus on. Other floaters seem to be a sectional worm with a darker end that is a sexual organ and hooks up with another floater, hence a C or a circle. Some are or become clear and appear dead, others with darker parts seem to be alive and well. The clear ones will fade and disintegrate eventually. Darn this big one, though;it is like a swooping bat or bird with a curved kite tail. I even thought I was seeing a scurrying roach off to one side! Fantastic to know there is a cure! Eye drops were like giving it vitamins, no help at all. I wanted to pluck it out. Thank you for taking away my worm theory. Thank you very much for the lucid, specific and extremely helpful article. It has been of tremendous value to me. It can be very difficult to discern whether the lack of broad adoption of a medical procedure is because of inadequate data or inadequate evidence of effectiveness; or simply because of a lack of full understanding of a procedure's safety and viability by the medical community, and a lack of incentives for adoption. This article has provided me with a tremendously useful perspective, and has served as a starting point for investigation of whether this procedure could be helpful for me. Thank you so very much. hello sir, i was suffering from eye floaters 5months back & i have undergone & completed 3sittings of laser treatment (Laser vitreolysis) 3months back but still the floaters have not disappeared completely. there are still some minor floaters are left so please suggest what can i do to get rid of this floaters completely. Also one imp thing that doctor who treated me for the same had suggest me to not to lift high weights for better results but i am now planning to join a gym in few days, so please depending on my above written situation tell me whether i should join now or wait for few months. i donot want the floaters to be back again. I am not a doctor and not qualified to give you any advice, other than do what your doctor recommends. Out of curiosity, who performed the laser treatment? I have been bothered by very large cloud-like floaters in both eyes for several years. For the last 6-8 month ago the floatersin my left eye have become more and more debilitating and my ability to read newspapers, magazines, and (th last straw) road signs diminished. I was strongly considering laser vitreolysis and had even scheduled the appointment. My local ophthamologist discussed it with me and felt that the risk was low. I also returned to an ophthamologist that I had seen earlier to get his opinion and he did not speak badly of the laser surgery but convinced me that for a person with no other eye problems, a vitrectomy was very little risk. I had been avoiding this procedure but when he said "absolutely no more floaters ever' he convinced me. So I canceled the laser vitreolysis appointment and scheduled an appointment with a surgeon he recommended as the best for vitrrectomies. I had that surgery a little more than 2 weeks ago with wonderful results. Very little recuperation and my vision is wonderful. I would suggest that people in the same category as me--a healthy eye except for the floaters--realize that the statistics we see for the problems with vitrectomy include a majority of patients with other eye problems. It was definitely the right decision in my case and should the floaters in my right become intolerable I won't hesitate to have the procedure again. Thanks for the thorough report on a procedure that should be much better known. I am forwarding this link to my eye doctor, and will be looking into making an appointment with Dr. Karickhoff. Thanks especially for interviewing the doctors. I'm so glad to know that it's possible to submit this procedure to insurance under code 67031. I will pay out of pocket if necessary to get this obnoxious floater out of my right eye, but getting it covered is certainly worth a try!